Are you an outdoors enthusiast looking for an outstanding scenery with no crowds? Do you search for trails that will take you to the world of peace and solitude? 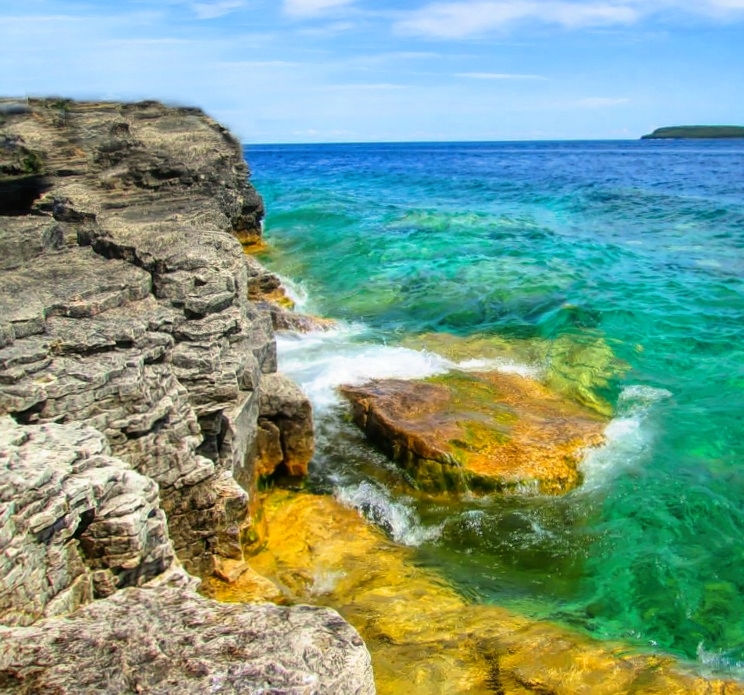 If the answer is yes, then Bruce Peninsula National Park in Canada will meet your needs. Located just four hours northwest from Toronto, the park delivers all you need for a great vacation. 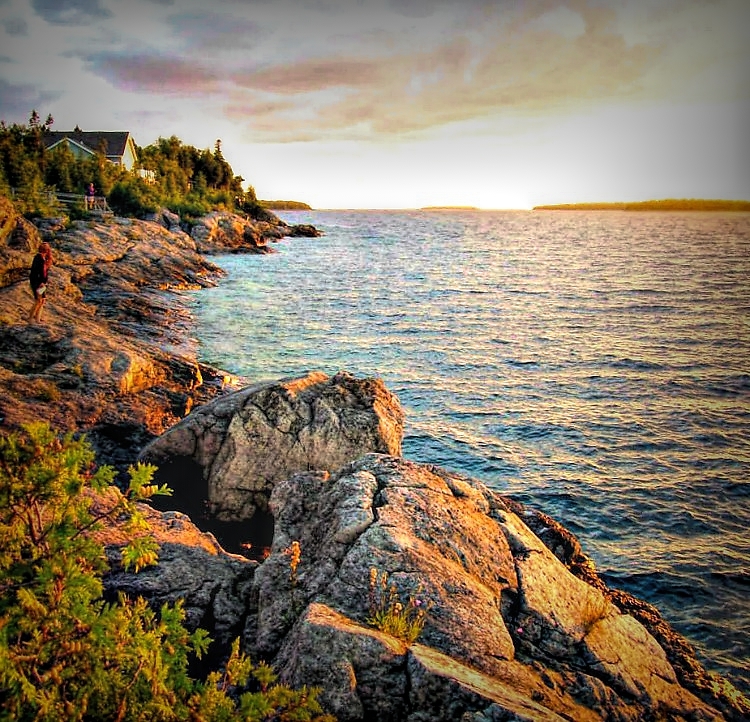 Make scenic village of Tobermory your base to access biking and hiking trails, boating and fishing, sunset cruises, and another Canada’s lesser known treasure, Fathom Five National Marine Park. I have no tendency to visit same places over and over again but how many times did I visit the picturesque village of Tobermory? Five! 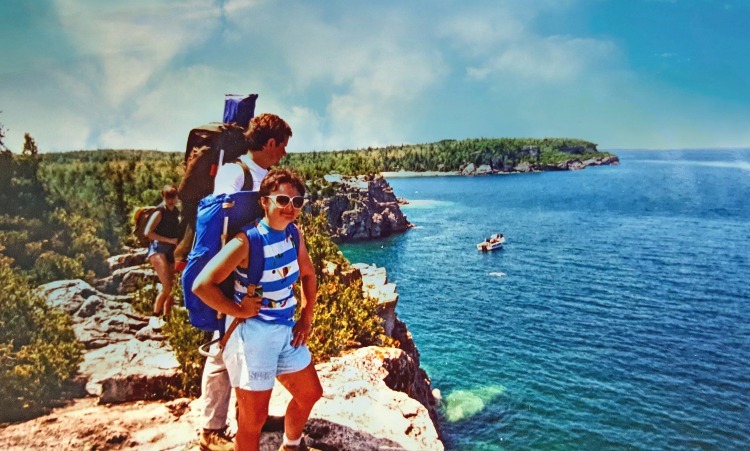 First time in 1990, when my Canadian friends invited me for a backpacking trip to Bruce Peninsula National Park. When I arrived to start the hike, I could not believe what I saw. I did not expect this kind of scenery. It was so stunning, I fell in love with the area on the spot. In my eyes, no place in the East gets even close to its beauty. 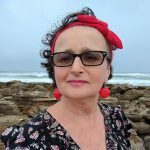 What brings me back? 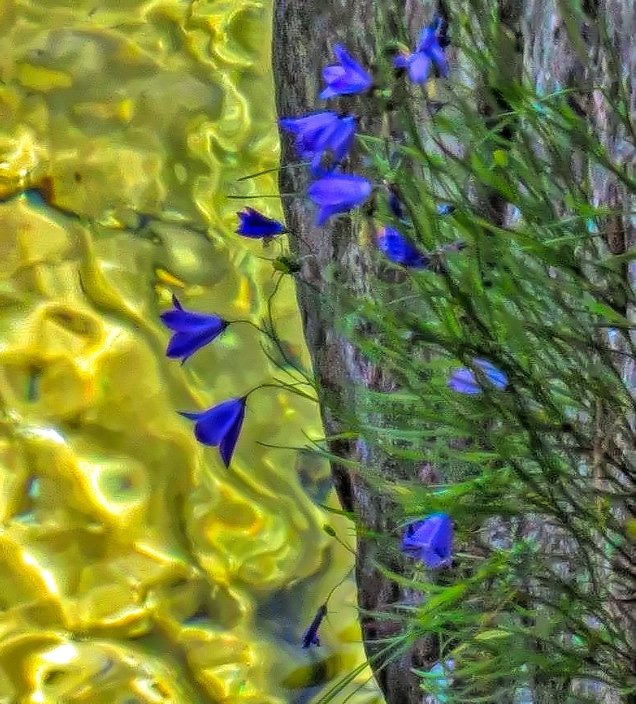 Primarily the color of the water, ranging from turquoise to deep blue. And then cliffs, little coves, grottoes, cobble beaches, flat sheets of rocks, and beautiful wildflowers somehow surviving on these rocks. Every turn delivers a new spectacular image. Apart from scenery, I love the fact that I can reach Tobermory by car. 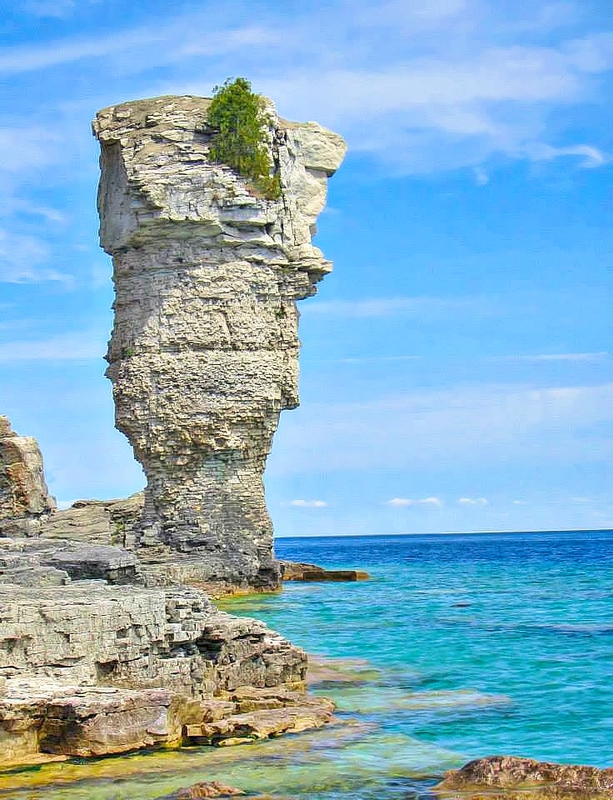 It is located on Hwy 6 at the tip of the Bruce Peninsula, 186 miles/298 km northwest of Toronto. Takes me around twelve hours to get there from Pennsylvania, but I do not mind. It is still much cheaper and more enjoyable than flying vacations. Plus, I can make an overnight stop at Niagara Falls or Toronto. 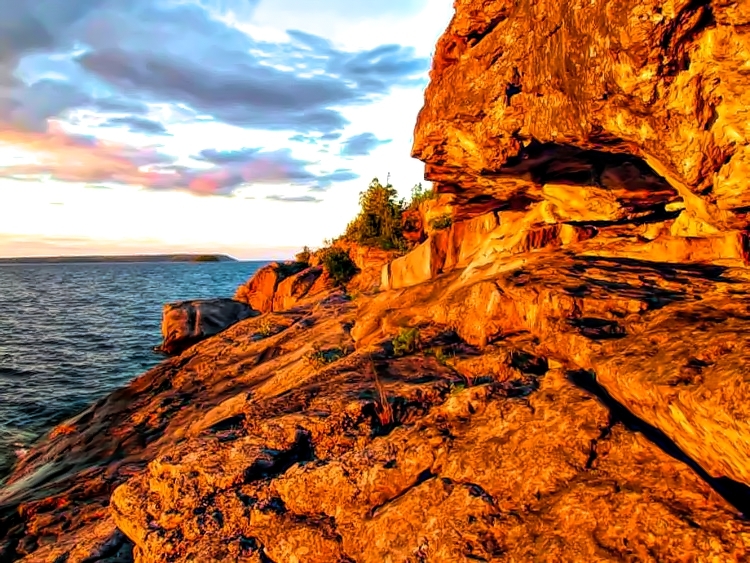 As the main tourist center for the area, Tobermory serves features hotels, restaurants, grocery stores, liquor store, and Bruce Peninsula National Park Visitors Center. 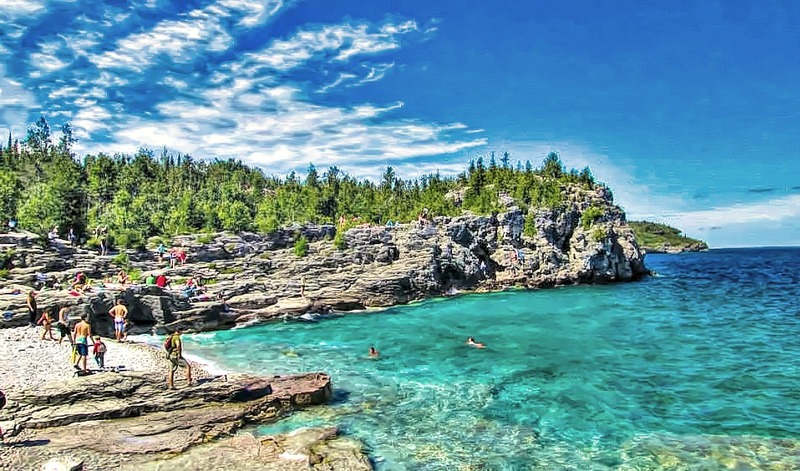 Also from here, take a boat excursion to Fathom Five Marine National Park. Tobermory is typically a few degrees colder than Toronto. Most of the businesses in the town are open from May until October. They are closed for the other seven months of the year. Summers are pleasant with temperatures in the 70’s during the day and no humidity. You will find plenty of choices when it comes to lodging, but many hotels are very basic and in desperate need of renovation. Camping is very popular in the area. Reservations should be made well in advance. The best way to enjoy the area is to rent a cottage. Units range from simple to well-appointed houses. All of them are beautifully located and majority right on the water. They are popular in the summer so make your arrangements well in advance. A lot of properties come with kayaks or boats. Some include bikes. Tobermory’s food options are rather basic. Make sure to try very popular fish and chips. It consists of a huge portion of local whitefish fried in a dough and served with fries. It is tasty but heavy. I suggest to take one order for two…this way, without feeling guilty, you can supplement your dinner with a great Canadian beer, or two! The majority of restaurants offer great views of the harbor, so even if food is not first class, dining in Tobermory is a pleasant experience. You will find grocery and liqueur stores right in the village. Try the local smoked fish! The stunning Bruce Trail runs along the edge of the Niagara Escarpment, a UNESCO World Biosphere Reserve. 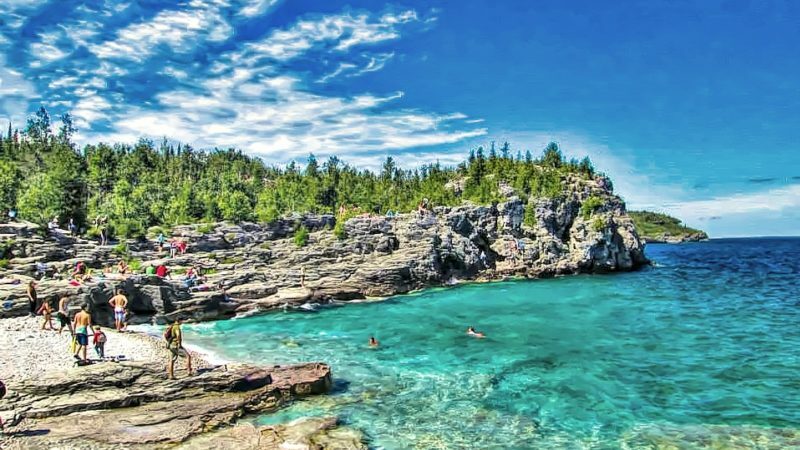 It begins in the Niagara Peninsula and stretches north, ending in Tobermory, where you will find the most spectacular views on the entire trail. 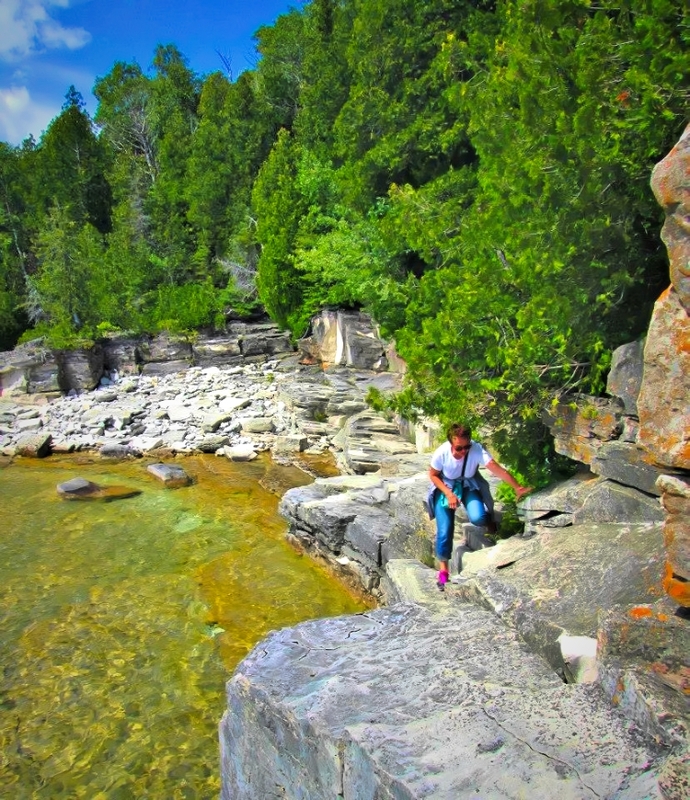 The Georgian Bay shore provides opportunities for an hour walk, a full day’s hike or a backpacking trip of several days. From the small cold water streams to the big open waters of Lake Huron and Georgian Bay, the Bruce area is an angler’s dream. Be advised that most fishing in the Tobermory area requires a boat. If you want to increase your luck, consider going on a fishing charter that will take you to the best fishing spots in the area. These charters leave from Little Tub Harbour in Tobermory. 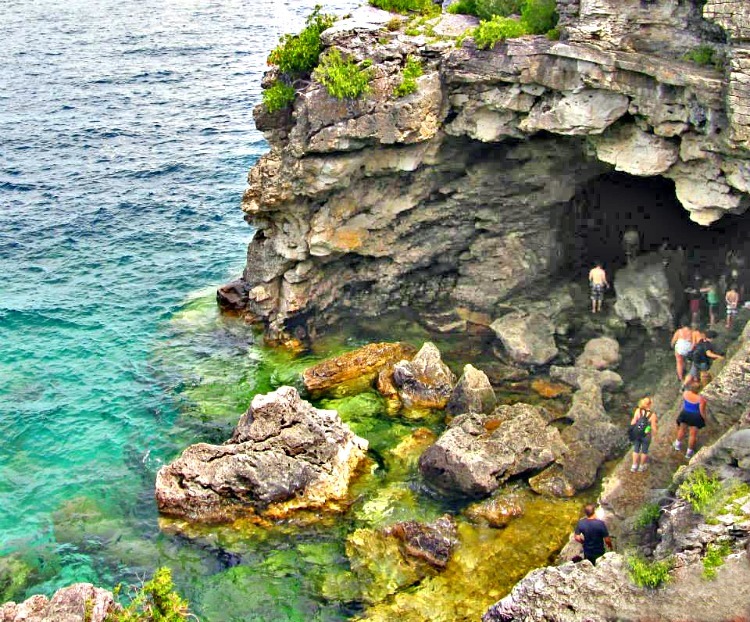 Diverse scenery of Bruce Peninsula National Park will make you want to explore more – photo by Yvonne Jasinski / Credit Card TravelingMom. 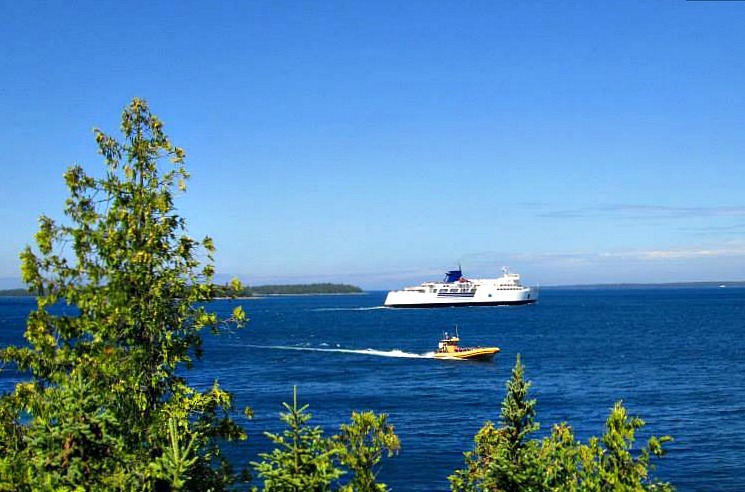 A symbol of Tobermory, the Chi-Cheemaun Ferry will take you to picturesque Manitoulin Island. You can also enjoy a dinner cruise on the board. Singing Sands and Dunks Bay are beautiful sandy beaches suitable for families with small children. Shallow and warm waters guarantee hours of family playtime. Canoeing or kayaking along the shoreline gives a unique perspective of Bruce Peninsula coastline. Make sure that it is a really calm day when you go out on open waters of Georgian Bay. If you are looking for relaxing and peaceful kayaking or canoeing, head to nearby Cyprus Lake or Cameron Lake. Visit for a day or backcountry camp on starry-skied Flowerpot Island for a welcoming escape to nature. The scenery will take your breath away. Check out the incredible underwater sights. 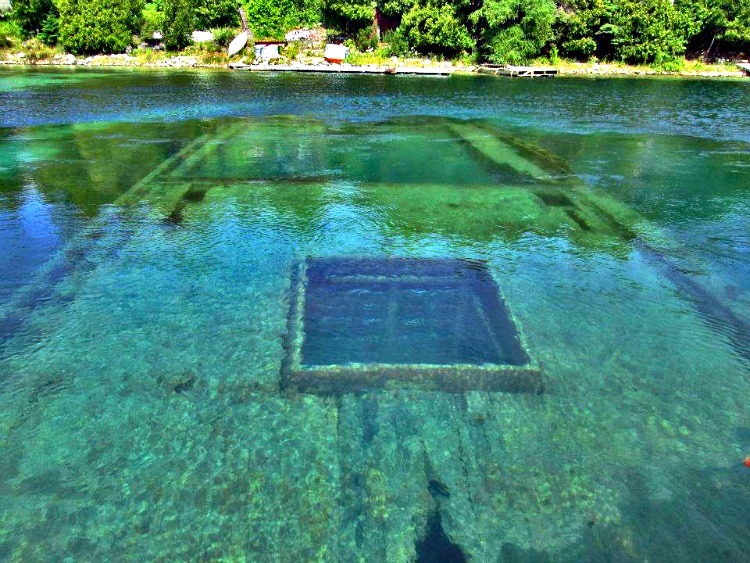 Take a glass bottom boat over the shipwrecks in Fathom Five Marine Park. Discover this freshwater ecosystem of ancient rock formations, cliff edge forests, and fascinating dive sites on 22 shipwrecks.